I’m knitting non-stop; must be winter! I do love this time of year to be able to read and knit more than any other season. As I’ve gotten older, I’ve come to like winter more and more. I admit a big part of that is the wood stove we installed two years ago! Living in a drafty old farmhouse meant (even wearing a scarf and big wool sweater) I was always chilled in the house. Sometimes I’d take a steaming hot shower just to get rid of that feeling of being chilled to the bone. That all changed with the wood stove… our main living area and kitchen areas are now toasty warm, and one of my favorite things to do in the winter is indulge in a little knitting with my back practically right up against the thing! I guess I can appreciate the charm of a brisk day, early nightfall and that urge to eat heavy food and hibernate when I have a warm cozy place to nestle down next to. But back to the knitting! Currently I’m making a hat for DH for his birthday next week. He doesn’t wear a lot of knitted things himself, so I hope he’ll like this. I found a really soft alpaca yarn (Classic Elite Inca Alpaca) that is a color I know he’ll love. 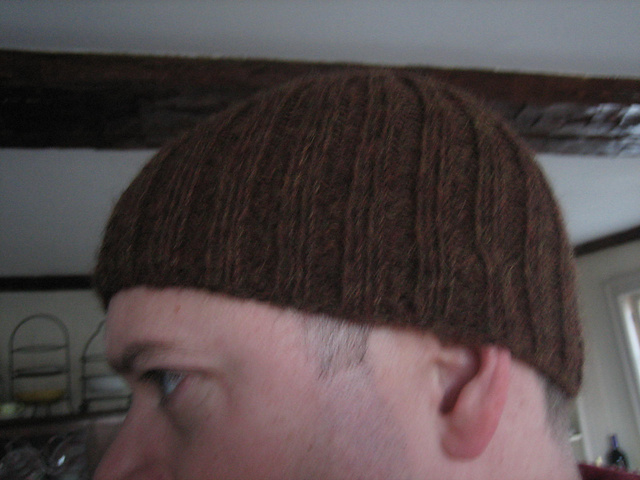 The pattern is from One Skein Wonders and I’ve used it before… it knits up quickly and makes a great basic hat. The only thing is it’s knitting up a lot lighter than I’d wanted, but I still think it will work. Aside from that I’m finishing up yet another attempt at a pair of socks for Peep #1. I’m knitting them in man-size (well, not quite) to try and stay on top of his growth spurt. 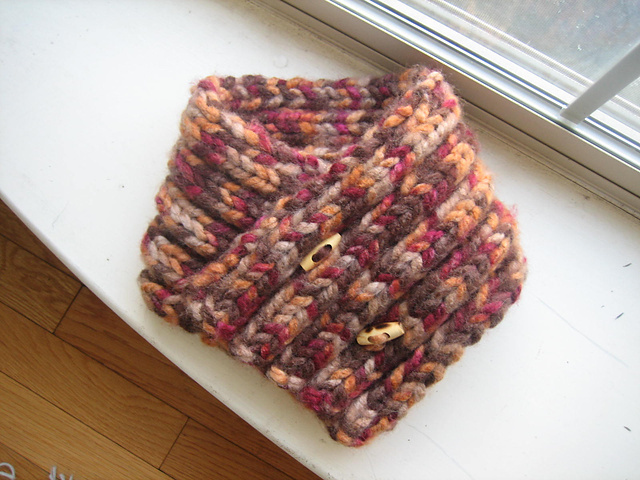 For the holidays I knit a couple of neck warmers called Pidge Podge from a pattern I found on Ravelry. These are AWESOME. First of all, they knit up super quick with Lion Brand’s Thick & Quick yarn; secondly, you don’t have to know how to knit button holes to make it; thirdly, they are so much fun to customize with different colors and buttons; and lastly, for people who like to wear something around their neck in the wintertime (no longer me–ha! ), they’re perfect because unlike a scarf, they won’t hang down and fall into the soup your stirring or–gods forbid– the toilet you are cleaning! Below is a picture of the one that came out the best… the colors were just so pretty and the toggle buttons I found complimented it nicely. coffee mug cozy for my brother who is also a big Harry Potter fan. So I went down from the suggested size 7 DPNs to size 5 and that worked well. I made another pair for Peep #2’s friend only with the Japanese kanji for strength on them instead of the Deathly Hallows symbol. She is a former homeschooler that went back to public school this year and has been having a bit of a tough time with it (kids making fun of her, not befriending her). 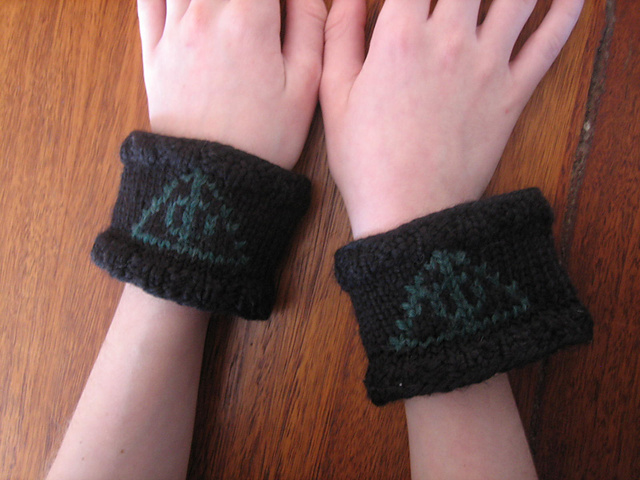 She’s handled it well for an 11 year old… she has a lot of inner strength so I wanted to make her wristbands to match it! Anyway, the kanji was a challenge too because I had to find an image and create my own color chart for it. But the process was actually fun and I was very happy with the finished product! Finally, I completed my first crochet project! 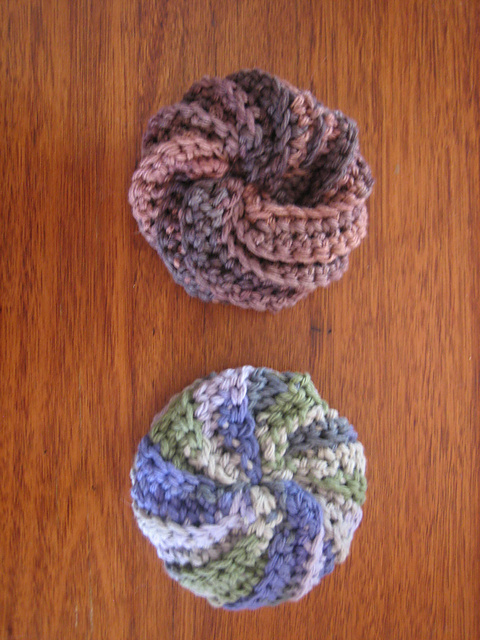 A couple of Spiral Scrubbies. These are great for wiping up counters because unlike the dishcloths I use for cleaning dishes they don’t flop around making a big miss. Plus they look really cute! [this is good] I love One Skein Wonders and have made many of their projects. Me too, Lizzie! It’s one of the knitting books I go back to again and again.